Just a bit more to do. Google Earth for helping me find the bridge in the first place. Keith and Val Padgett, for sending me several images of the bridge when I was preparing this website. "We are happy to hear that you like our photos. This old bridge is located in a very picturesque place. The area around it is uninhabited nowadays. While taking these photos we saw some hares and geese. But this bridge is one of the places on the Falkland Islands which is very popular with tourists. It is mentioned in every guidebook about the Falkland Islands (even the price is known - 2290 pounds). Unfortunately, the bridge is not in good condition and closed for crossing even for pedestrians. Goose Green is still exists, but only 17 people live there, but there is one school and one shop. On the other side of the bridge only one house remains inhabited in Walker Creek. Nowadays it is cheaper to detour round by car than repair the bridge." Their account of their tour of Falkland's, Chili, Tahiti 2006 is in Russian, but a selection of their photos is listed on the Look at it now page. Leona Roberts at the Falkland Island Museum and National Trust, for her friendly advice, comments and the additional information she found for me. Alison Barton at the Falkland Island Museum and National Trust, for material she gave me on the current state of the bridge and historical articles about the bridge and performances of the Zachariah Fee play. She told me that the museum website now has a page in the National Trust section devoted to the Bodie Creek Bridge. Phil Middleton at Falkland Collectibles for the First Day covers he sold me. Wickham, who has a site dedicated to his Falkland memories with accounts of his adventures at the bridge in February and again in December 1984. This was back when the bridge was still open for business. He has a photo of a Land Rover crossing the Bodie Creek bridge and assures me my grandfather built in a lot of safety margin! Sadly I think that safety margin has now expired. Sharon Jaffray, for the very nice article she wrote about this site in the Penguin News. Canon Stephen Palmer, for his well-researched, beautifully written and illustrated account of "The Building of the Bodie Creek Bridge, 1925" which was published in the Falkland Islands Journal 2010 and also for his biography of my grandfather, published in the same edition. Is It The Most Southerly Suspension Bridge? It's a claim that have often seen on the web and have been happy to repeat, but is it true? I am indebted to Ana Berbel who wrote to me recently with a question about a very similar old bridge built in 1918 over the Rio Grande in Tierra del Fuego. Clearly it was further south than the Bodie Creek Bridge and it predated the one on the Falkland Islands. These pictures Ana sent me show that it was recently destroyed in a storm. Maybe this proud claim is now valid after all? I have also found some terrific photographs and descriptions on these websites. More Bridgemeister bridges The similarity to the Golden Gate bridge is uncanny! Wikipedia entry for the Bodie Creek Suspension Bridge I think this was the first place where I found the bridge after Google Earth! International Tours and Travel give an honorable mention to the Bodie Creek Bridge in the section on Darwin. Mysteria magazine has a description of the Falkland Islands and photos. Kelper's photos on Smugmug. A very tight turn? It is OK for a sheep. Comment by DaveSumner (Tourist ) in Google Earth Community. "Yes there is a suspension bridge in the Falkland Islands" He also has links to the bridge in Google earth and Google maps. 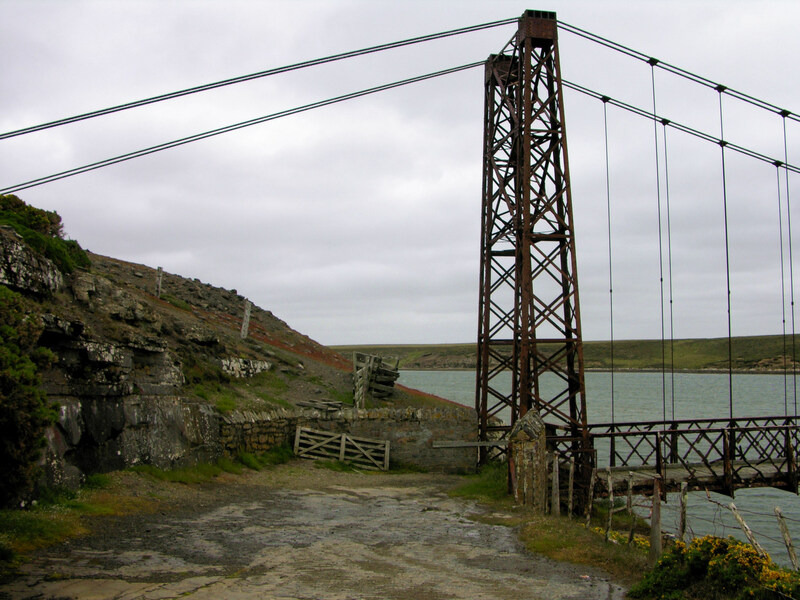 In part 1 of Nico Housen's Falkland Islands photo album there is a beautifully angled and lit picture of the bridge. Discussion of the Bodie Creek Bridge at 84 years on the Eng-Tips forum. Thanks to everyone who has posted these photos and information on the web. Without them I would have no idea what it looks like now. Seeing them all makes me feel as though I have been there. I would also like to thank all those who have either commented in the guestbook or have taken the trouble to email me with their feedback, accounts of their visits to this area and the many photographs they have sent me. It has been a delight to receive such encouraging feedback from all over the world. Thanks to my late father Harry 'Pete' Peters for letting me scan the pictures and thanks to my wife Audrey for her patience while I built this site. 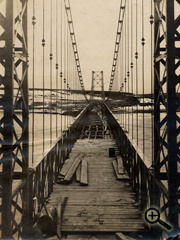 Finally, a great big thank you to my grandfather Charles Peters for building the bridge and taking his photos.